The ATEX Workplace Directive (99/92/EC) regulates plant owners and operators‚ and ensures that areas in which explosive atmospheres may be present are appropriately classified into zones‚ and that the equipment placed within these zones is suitable for use. The ATEX Equipment Directive (94/9/EC) regulates equipment manufacturers and vendors‚ and ensures that equipment placed on the market for use in explosive atmospheres does not increase the risk of an explosion. These EU directives are made statutory law in the UK by DSEAR (Dangerous Substances and Explosive Atmosphere Regulations :2002). These typically require multiple site visits to gather the required information and provide advice as to how the hazard zones can be managed and minimised. The visit(s) will be followed by a report detailing hazardous area classification. Autocad drawings will be provided to show the extent of these hazard zones. DSEAR signage can also be provided. This document is intended to assess the explosion risks associated with this equipment and to record the measures taken to minimise that risk. The assessment is made using European Directives and EN Standards. In addition‚ these are supplemented using HSE Technical Guidance Notes‚ published papers and documents‚ produced by technical‚ educational and research establishments‚ along with established codes and protocols from other approved world bodies. An equipment conformity assessment is included for both new and existing equipment with a view to determining the appropriate equipment protection levels (EPL) and to record the appropriate ATEX certificate details. The EHR will also determine the basis of safety for each plant item and identify measures to mitigate the effect of an explosion including a review of propagation. Each plant item is assessed for the risk of a viable explosive atmosphere being present and the risk of an ignition source occurring. Risk reduction measures are then applied and the risks re-assessed. The consequence of the explosion is then reviewed considering occupancy levels‚ likelihood of injury or even death. The consequence in terms or plant replacement cost and the effect on production or product quality are also considered. Where the residual risk or consequence of an explosion is considered too high‚ protective measures are identified. SSL will work with specialist suppliers to identify appropriate prevention and protection techniques‚ and a record of the reasoning behind their application. Note that the Hazardous Area Classification and a suitable and sufficient Risk Assessment are both requirements of the DSEAR regulations. Explosion venting is commonly used as a means of protection in the Bulk Materials Handling Industry. Assistance can be provided with regards vent sizing using either calculation or CFD modelling‚ which can lead to more realistic vent sizing on large vessels. An area of contention that can present a real challenge to clients and system integrators alike is the extent of explosion blast zones and the necessary exclusion zones. SSL has considerable experience in modelling the explosions and determining the extent of exclusion zones and the loads on adjacent structures. 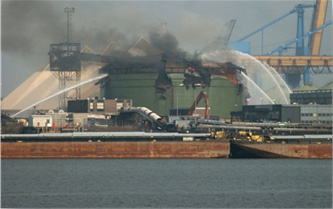 SSL can also provide the design of explosion deflectors that can help mitigate these affects. SSL can carry out a detailed Ignition Source Assessment for “equipment related” ignition sources in accordance with BS EN ISO 80079-36:2016. This provides a written record of the ignition risk assessment to assist certification for new equipment or to assess the suitability of existing equipment for the hazard zones identified. SSL also provide forensic investigation service of fires‚ explosions and related incidents and will provide on-site investigation and well researched objective reports.